Heat griddle or skillet; grease if necessary. In large bowl, stir all ingredients except syrup until blended. Pour 1/2 cup batter into plastic squeeze bottle with narrow opening to use for making letters. Drizzle batter from bottle onto hot griddle to form letters (letters should be made backward to appear "right" when pancakes are served)*. When bottom side of letter is brown, pour about 1/4 cup batter in circular motion over letter to form a pancake. Cook pancakes until edges are dry. Turn; cook until golden brown. Serve with syrup. *If desired leave only letters; cook like a regular pancake. 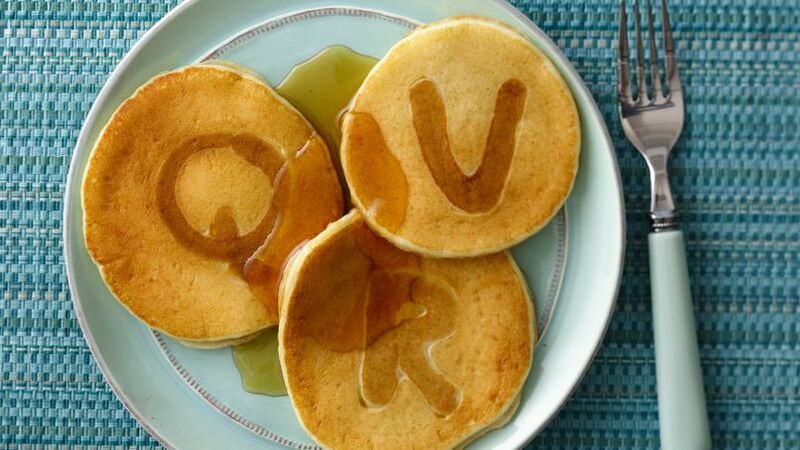 Delight your kids with these alphabet pancakes made using Bisquick® Original baking mix – ready in 15 minutes.